Performance Platform. 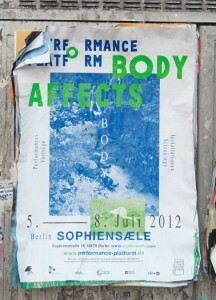 Body Affects was a 4 day festival which took place 5-8 July 2012 at Sophiensaele, Berlin. Accompanying the festival was a reader, edited by festival curators Bettina Knaup & Silke Bake with contributions by Antonia Baehr; Donna Haraway; André Lepecki; Patricia Ticineto Clough; Wietske Maas & Matteo Pasquinelli. Graphic design by eps51 . 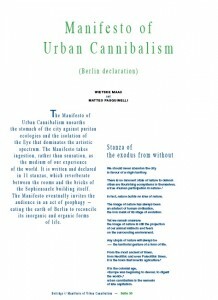 The Manifesto of Urban Cannibalism (Berlin Declaration) was adapted for the Performance Platform Body Affects. 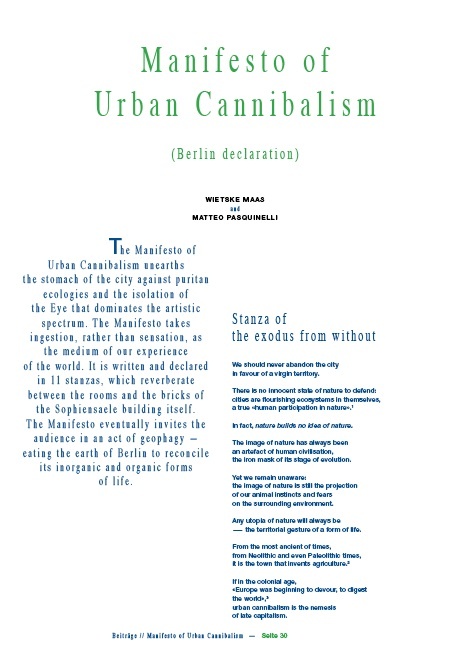 The Manifesto (published in the reader) was also a performance enacting the organic and inorganic voices of the city, of the liquid flows of minerals and invisible ecologies of microorganisms that constitutes the bodies of buildings and beings. The Manifesto will be proclaimed by the historical larynxes and the deep memories of the Sophiensaele building itself. Audience is invited to partake and feast on a geophagic convivium.